We teach classes from Paddington to Vaucluse to Maroubra in your home pool. Teaching kids to swim as early as possible improves their safety as it helps to build their competence and confidence in and around the water. If you need private swimming lessons in the Eastern Suburbs, Tanya’s Tadpoles is the one you can trust. We provide fun infant aquatics and stroke correction classes for kids and babies as young as 5 months old. The lessons will be conducted in your own home swimming pool so your kids can learn to swim in a convenient and comfortable environment. We believe being in a relaxed setting is a key to learning efficiently. 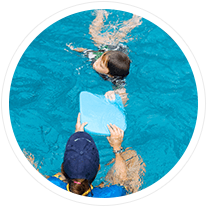 Our babies and toddlers classes work on teaching children aquatic independence. 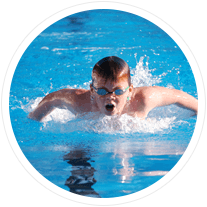 We teach learn-to-swim and stroke development classes for older children, and our qualified staff work with kids up to junior squad level, refining all strokes. Being a competent and confident swimmer is an essential life skill especially when you live in the Eastern Suburbs of Sydney where there are tons of beaches, secret coves and aquatic reserves to explore.